Corgi has launched two commemorative Aston Martin DB5 models to celebrate the 50 year anniversary of their Goldfinger scale model. In 1965 (one year after the movie Goldfinger was released) Corgi started production of the Goldfinger James Bond Aston Martin DB5, and won the first Toy of the Year for the model. 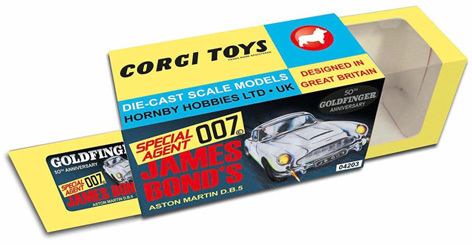 Now, in 2015 Corgi presents a new release, fully featured DB5 for a new generation of James Bond fans. The model is presented in the iconic silver livery of the film (£19.99), and a limited number will also be produced in a gold finish (£19.99) (already sold out during pre-order, but some of these will probably show up on eBay). What's quite cool about the model is the special retro-styled anniversary box. The model will come complete with many features such as the James Bond driver, ejector seat, retractable machine guns, bullet-proof screen and rotating number plate. These Corgi DB5 models were supposed to be ready for delivery in January 2015 but this was postponed and now scheduled for 14 February 2015. Order the silver model on Corgi.co.uk now and take a look at the gold model here. The original vintage models can fetch high prices on eBay. I have the 1965 korgi db5, so where is the red tire slashers? Why are they not on the new one? '65 model didn't have tyre slashers. I am looking for the gold edition. Are there any available? Thank you. Wayne. What is the selling price for a 1965 James Bond car still in the box?